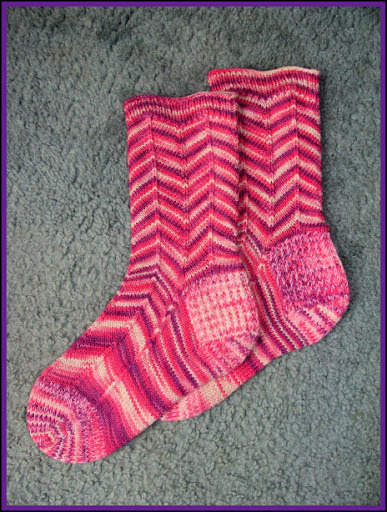 Finished my Pink Jaywalkers just in time for March. Yarn: Fearless Fibers 100% Classic Merino sock yarn in Peppermint colorway. Needles: Size 2 Addi Turbo Lace Circulars. Comments: Use a size 2 needle instead of a size one. The fit is much better. I LOVE this pattern. It was a lot of fun. Now on to Pomatomus for April. 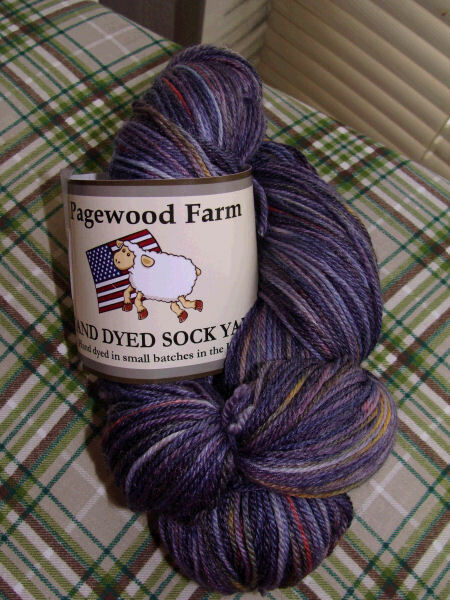 I'm going to be using Pagewood Farms Yukon sock yarn, which I've not used before. I've been wanting to try a sock yarn with bamboo in it, though, and this stuff has that-and, of course, it's in shades of purple, the color name being Prism. It's 70% Superwash Merino, 20% Bamboo, and 10% Nylon. It's a 4oz skein with 450 yards. very nice Jays! I have not found a pair I didn't like, that pattern is the best!